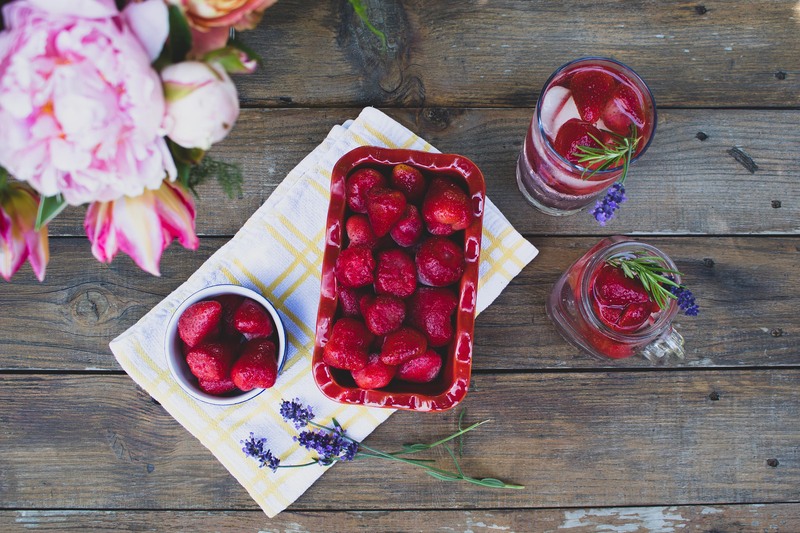 Enjoy what your garden has to offer with this cooling strawberry, rosemary, lavender infused water. Toss 2 – 3 chopped Stahlbush frozen strawberries in a glass with ice and water. Drop in some fresh rosemary and lavender for an aromatic, refreshing treat. For extra flavor, muddle your ice and strawberries together to release a little bit more of that strawberry taste! You’re never too old to enjoy an ice pop, and this recipe proves it! Enjoy a delicious, sweet ice pop to tame the temp on even the hottest summer days. This recipe makes about 10 ice pops. Combine strawberries and sugar in a bowl, and let sit for about 30 minutes or until strawberries are beginning to defrost and become juicy! Once defrosted, add strawberry mixture and water to a saucepan over medium-low heat. Simmer about 7 – 10 minutes or until the strawberries are soft. Transfer the mixture to a blender and add the lemon juice. Blend until smooth. Let the mixture cool completely, then pour into molds, leaving ¼ inch space for the ice pops to expand. Place in the freezer. After about an hour, insert the ice pop sticks into the center of the molds. Freeze for another 5 hours, or until solid. Enjoy! They say breakfast is the most important meal of the day, but sometimes when you hit snooze too many times, you’ll need something quick and delicious to get out the door. Look no further than this simple, quick, and filling smoothie recipe to help you get through the day! Add more liquid if needed to reach desired consistency. Take your taste buds on a tropical vacation with this deliciously tangy Strawberry Citrus Smoothie! Kick it up a notch by turning this into a smoothie bowl by topping it with granola, coconut flakes, extra fruit, chia seeds, and more! Add more liquid id needed to reach desired consistency.